San Diegans will get their first up-close look at Tesla’s Model 3, the company’s affordable electric car option, starting Friday. Those visiting the Tesla showroom at Westfield UTC (4545 La Jolla Village Dr., Suite D17) can get an in-person view of the Model 3, sit inside of the vehicle and learn more about its features and capabilities. The showroom opens at 10 a.m. Drivers in Arizona eager to check out Tesla’s highly anticipated Model 3 electric car now have a chance starting Friday at the Kierland Commons Tesla showroom in Scottsdale. 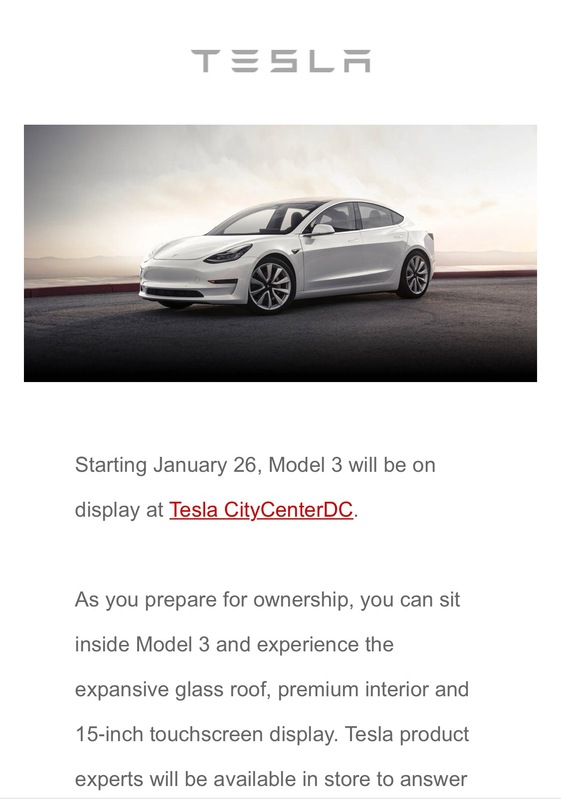 Starting January 26, Model 3 will be on display at Tesla CityCenterDC. As you prepare for ownership, you can sit inside Model 3 and experience the expansive roof, premium interior and 15-inch touchscreen display. However, anyone who wants to take a peek at this vehicle, which has been widely praised, are encouraged to stop by Tesla’s showroom anytime beginning Friday in Southlake. There, a display version of the Model 3 will be available all day for anyone who wants to sit in it and (proverbially) kick the tires. Doors open at 10 a.m. the Tesla showroom at 257 Grand Avenue in Southlake. The car will remain on display indefinitely, for those who can’t make it Friday, a company spokeswoman said. Even if you local Tesla showroom isn’t listed here, try calling them up and seeing if they have a Model 3 on display or when they intend to receive on. I think in coming weeks, most Tesla showrooms in the U.S. will receive a display Model 3. People visiting the showrooms can sit in a Model 3 and view it up close and personal. But Tesla is not offering test drives yet. In order to test drive a Model 3, you’ll need to find an owner who will let you or you can rent one from an existing owner on Turo.